Lately I've been spending an awful lot of time with a new crush of mine and it goes by the name of cropped kick flare, it's going really well and I think we both really like each other. I've long since felt a bit stuck in a rut with jeans and had found myself rapidly falling out of love with them. 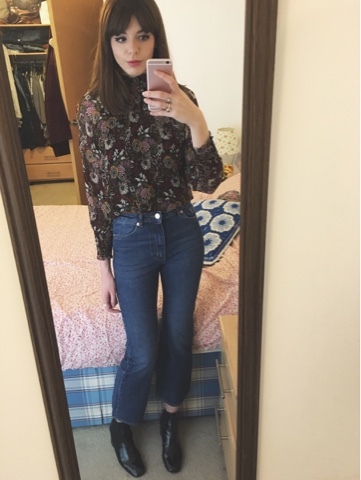 My go to for the past few years has been the Topshop Mom jean, a vintage high waisted fit which of late I'd felt like I'd done to death. 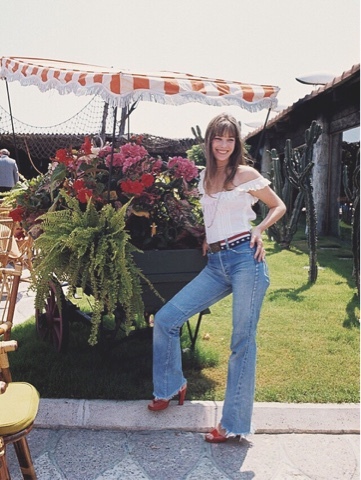 The cropped kick flare was a style I've been admiring from a far for a while and have always loved this look on Jane Birkin circa the seventies but was dubious about abandoning my trusty tapered ankle shaped jean that had never failed me. 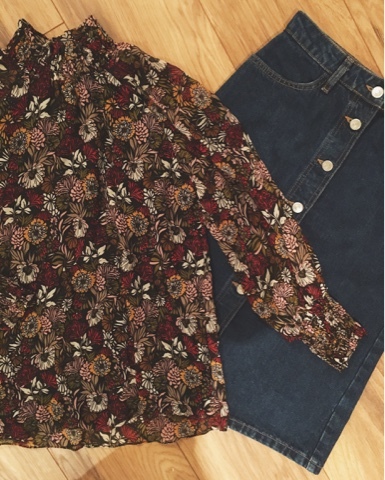 The cropped flare jean is the type of shape you can very easily get wrong and should you do so, you can swiftly go from looking like Seventies Birkin to Nineties girl band B*Witched. Due to the sheer fear of getting it wrong, I became a little picky over which pair I finally decided to buy and so after a mission impossible style hunt, numerous shopping trips, hours (exaggeration) of umming and awwing and copious returns I am pleased to announce I have found what I deem to be the perfect shaped kick flare. *Que applause*. I am now totally in love with this shape and they have officially replaced the tired old skinny jean. Hooray (sorry skinny's)! The first and most important rule with a cropped kick flare is the length is E V E R Y T H I N G. If worn with an ankle boot they need to be (and this is an approximate... Just kidding, you can put your tape measure away) one or two inches above the top of the boots or sat just on/just below the top. Why? 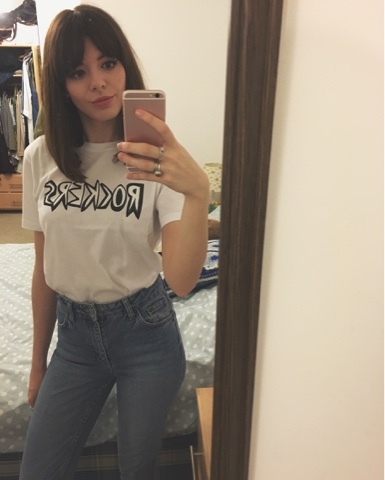 Because any shorter and you will look like you've tried to squeeze into your favourite Tammy girl jeans from way back in 1998. In short (no pun intended) you will look like you've out grown them and you don't want that. Second rule in my opinion is, a more chunky block heel works better (in any height) because there's something about a dainty heel that will make your flares look like a flag waving in the wind. If not an ankle boot then I would recommend going for a glove shoe with a block heel as pictured below. 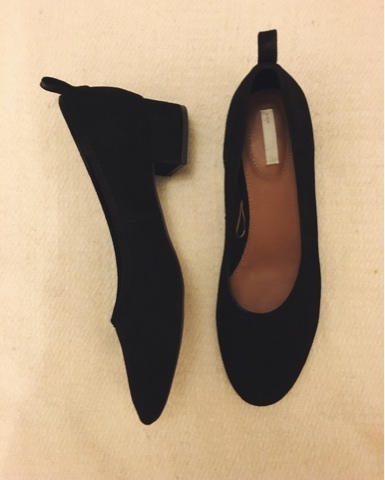 I'm a complete advocate for this shape of shoe at the moment, partly because they remind me of something my mum would have worn in the eighties and partly because they are a fresh spin on the "flat ballet pump" that was starting to look a little basic. Third rule is try and keep it high waisted, it's just more flattering! A low waist and a cropped leg is going to make you look a little short and stumpy in the middle, kinda like a square? Nobody wants that... Plus I always think a high rise jean makes it easier and neater when tucking in your top, esspecially if it's a floaty loose number like the one below. And after that I'm all out of rules! The rest is up to you, you are ready to go give your skinny a little time off and start showing the flare some love instead! If I had to pick a particular time of year where I feel the most uninspired by my wardrobe and when shopping seems like a bit of a drip I'd have to say around mid January to end of February. It's a tough time for shopping. It's the time when Christmas sales are still in full swing but all the best finds have already long since been snatched up and your left with an awkward shaped dress, in a awkward colour best worn by no one and most likely customised somewhere along the way with an awkward orange foundation mark in an awkward place after its many trips to and from the fitting room. 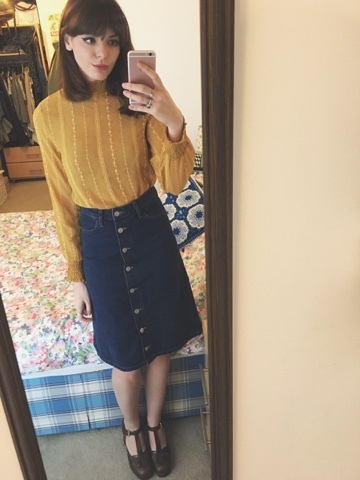 It's that funny time when spring/summer clothing starts gradually appearing in shops but we are just not quite ready to part with our chunky knits and winter coats. Mainly because it's still absolutely freezing, it's dark, it's a little gloomy and the colder I get the grumpier I get, therefore dressing prematurely for summer is a definite no thank you. January to February is a grey area. It's that in betweeny bit of the year. You're still regretting that second (tenth) Christmas left over sandwich, your skin hasn't seen sun in about 6 months (yes it feels like 6 years) and you used up all your jolly between 23rd December to 1st January. This year we've not done too shabby with the seasonal sales and it seems there's a hell of a lot more hidden gems still waiting to be bought, even now! I'm not big of shopping sale for impulse buys, I like to stick with my guns. If I didn't want it before it was a fiver well then, I don't want it now (shopping with integrity). I try to buy from my ever growing, ever unachievable wish list or I tend to buy pieces I know are still going to be wearable in a years time. 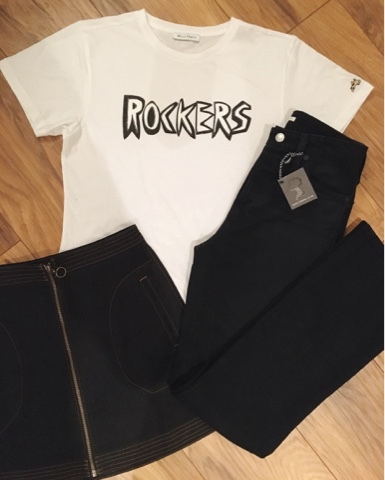 My hidden gems from last week include; THAT Bella Freud "Rockers" tee which was very high on my totally unrealistic, unachievable wish list. AC for AG Jeans high waisted, cropped kick flares in black because I'm addicted to this shape of jean at the minute and would have happily paid full price for these babies. Next up there was a wardrobe staple! An a-like indigo denim mini from Urban Outfitters I will wear to death because it goes with everything. 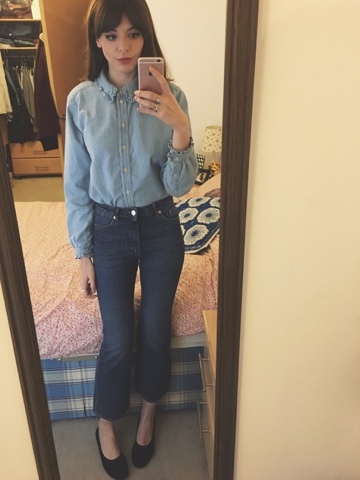 Other last minute finds include this denim button down midi from Topshop which I can not wait to sport with tanned legs and Birkenstocks over summertime and this seventies inspired Zara blouse. The blouse was another wish list item I am pleased to now have in my possession. 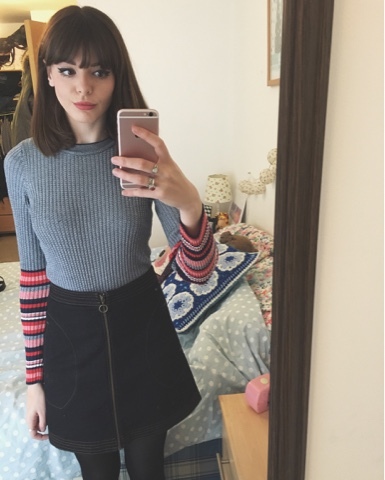 Although it's pretty difficult shopping new season Spring/Summer when it's still so miserable outside, I've managed to find a few pieces which can work easy for any season and are just so lovely I couldn't not buy them! 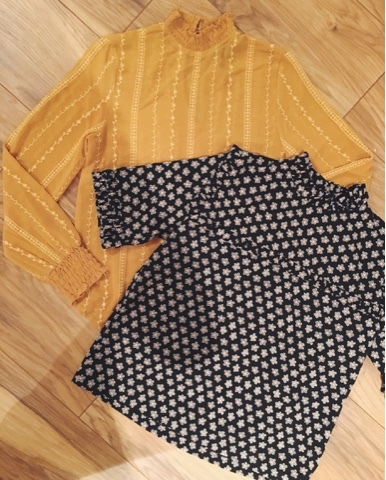 My two favourite picks are these two Topshop blouses. Both high necked with long sleeves so they're not too "on show" for February/March weather. 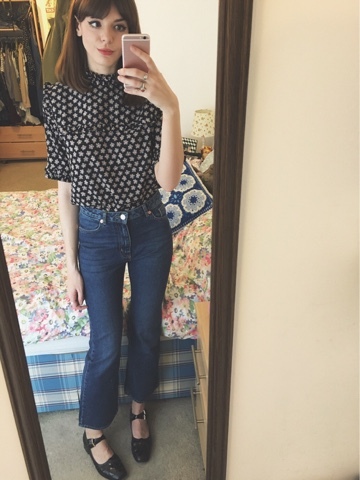 I'm a little obsessed with this seventies inspired blouse shape at the minute, so easy to style and VERY wearable. Mustard is a hero colour of mine all year round and works for every season. It's autumnal yet vibrant enough for summer and looks great with a tan or a more pastey skin tone (ie. my skin tone). The printed blouse although floral isn't too "Spring flowers", it reminded me of a Mary Quant style sixties print which of course immediately struck a cord with me. Below is how I chose to style them both. Ok, yes the first outfit has maybe a bit too much leg out for February but for drinks at the weekend, for me this was a winning look.